traders were shouting, "Sell! Sell! Get me out! We are going to hell!" traders were yelling, "Buy! Buy! Buy! All is well!" up a harmonic 270 points. It now is vulnerable for a sell off. clear six moves, the last being the Santa Claus rally. In a normal Chaos Clamshell, a move 7 would test the December lows. This is not a hard, fast requirement. Most fractals have one "runt"
move. So the move 7 may be a runt move. and diverge into the move 7 low. the popular bull market stocks have suffered serious declines. Yet even in bear markets, there can be spectacular rallies. So it helps to understand how chaos works in markets. For more, see my courses at Moneytide.com. 1/11/2019 1:28:35 PM MT Al****:: I'm done. Thanks for coming. No clinic next week. Have a good weekend. 1/11/2019 12:24:13 PM MT Al****:: GON: interesting that you should mention Jupiter and Neptune. Today Mercury is squaring Neptune and Venus is squaring Jupiter, both helio. 1/11/2019 11:25:20 AM MT Al****:: I ran into a bit of wisdom this week. It comes from a professional dowser who has dealt with energy fields for a long time, helping people navigate various problems. He points out that a lot of people have a lack of prosperity, so in their own way they ask for it. He says that is really saying "I am not prosperous." So you reinforce that belief. Instead, he says to simply thank the Spirit Of Prosperity daily. 1/11/2019 9:17:09 AM MT Al****:: Yes, plus the fact that sometimes fractals have more than 7 moves. On occasion, they have 13. This comes from two interlaced 7 move fractals. 1/11/2019 8:49:08 AM MT gon:: There is this Jupiter/Neptune square forming this month, it could lead to optimism once again, but it could also go the other way where maket participants realise they have been acting on ilusions..In this case, the 7th wave could be something more than a runt move. I don't think the 2018 top will fall anytime soon. 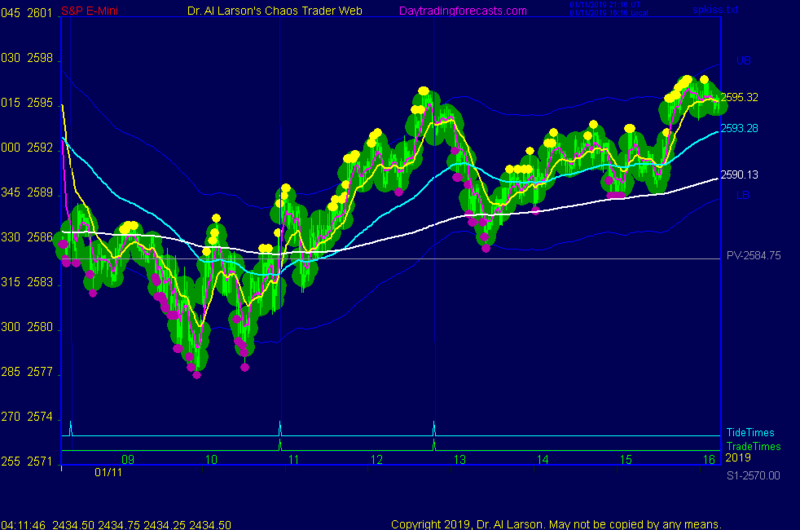 I do have a ZD36 forecast showing a possible rally up int0 Feb 21, followed by a decline. I have seen some buying of tech stocks by bargain hunters, Most of those charts have a up power curve, followed by a sharp drop. Usually that pattern only gets a dead cat bounce. 1/11/2019 8:04:28 AM MT gon:: Al, I have a long-term position entered at the very top on the Dow, above 26,000. My view, supported by your analysis, is that top will hold for a while. Do you see any upside risk threatening that Fireball top for the next months? 1/11/2019 7:21:33 AM MT Pyc:: Dr al I sent you an email from pb*****n@gmail.com about your course CTME. Awaiting a response. 1/11/2019 7:00:03 AM MT Al****:: GM all-good luck today. Chaos clinic is posted on AUX page.